Kala Rongo Monastery, founded by Norlha Rinpoche in 1990, provides unique opportunities to Buddhist nuns in Tibet. Not only is it rare for women to have their own monastery, but in addition Kala Rongo is widely celebrated as the site of the first monastic college for women in Tibet’s history. More than 300 nuns, of whom 200 have completed the three-year retreat, are currently engaged in religious practice and study at Kala Rongo. Thanks to your generous support, reconstruction of the Kala Rongo shrine hall is almost complete and the Guru Rinpoche Statues have been sponsored. Dharmakaya Level: Amitabha, Kuntuzangpo and the Five Buddha Families. Sambhogakaya Level: Dorje Sempa surrounded by Chenrezi and the Peaceful & Wrathful Deities. Nirmanakaya Level: The hundred terma finders and various deities. 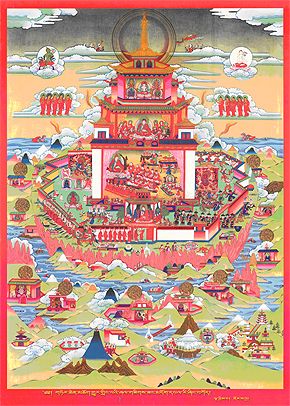 The 12 Special Treasure Texts (Namtrul Chönyi), revealed by Chögyur Lingpa, will be distributed among the three upper tiers. These texts were found at the site of Kala Rongo. The ground level is the main shrine room where practice will be done and tsoks (ceremonial feasts) will be offered. In a lotus lake will be the great statue of Guru Rinpoche. Eight rooms will be built nearby, housing eight Kala Rongo nuns engaged in a Guru Rinpoche retreat based upon the (Namtrul Chönyi) texts. A fenced garden will surround the palace and visitors will be able to walk up each tier of the palace. The 10-foot Guru Rinpoche statue has been filled with blessings and is temporarily housed in Kala Rongo’s new monastery. The Zang Dok Pal Ri foundation has been completed and the first level is almost finished. Construction will resume in Spring 2011. Projected cost of construction: USD $110,000. Any donation toward construction of this Palace is deeply appreciated. Please include with your donation the names of those for whom you wish to dedicate prayers. All donations are tax deductible to the extent of the law. Artist's rendition of the Zang Dok Ral Ri. NYEMA Projects Inc. is a 501(c)(3) nonprofit organization. Copyright © 2011 NYEMA Projects, Inc. All Rights Reserved.